An ex-political detainee, Wang Kui Inn, 27, yesterday described how she bought Western medicine from Dr. Poh Soo Kai and took it to the Betong-Raub area for the Sixth Assault Unit of the Communist Party of Malaya (CPM). Wang, wife of another ex-detainee, Pang Hee Fatt, went to Dr. Poh'c clinic in Balastier Road on three occasions between January 1974 and early this year to buy medicine, Dr Poh only accepted money for the medicine after she pressed it on him. Dr. Poh was re-arrested on June 4 this year. This was the second arrest under the Internal Security Act. He was first arrested in February 1963 and released in December 1973. Wang said that in January and February 1974, a woman by the name of Siong Pek gave her a list of Chinese and Western medicine and $300 in cash. Siong Pek told her that the medicine was for the Malayan National Liberation Army (MNLA). "As Siong Pek was my good friend and as this was also to serve the MNLA, I went to the Rakyat Clinic at Balastier Road about two days later and asked Dr. Poh to help in purchasing the medicine," she said. "When Dr. Poh asked me why I wanted these medicine, I told Dr. Poh that the medicine was wanted by my "Malaysian friends." Dr. Poh asked me to go back the following day." When she turned up at the Rakyat Clinic the next day, Dr. Poh gave her three types of medicine - three bottles of pills for gastric pain (300 tablets), Vitamin B12 compound for injection (eight to 10 phials) and a bottle of antipyretic pills (300 tablets). Wang said that Dr. Poh told her how to use the medicines and she noted it down in Chinese. Later in the year she went to Bentong-Raub to meet Ah Lee, the leader of the Sixth Assault Unit of the CPM. Ah Lee gave her more tasks and one of these was to buy more medicine. In May or June 1975, Wang again went to Dr. Poh's clinic in Balastier Road. "This time, Dr. Poh did not ask me why I wanted the medicine. Like previously, I was told to come back the following day," Wang said. This time she got four types of medicine - 10 phials of penicillin (which was not available on the market), a bottle of pills for gastric pain, a bottle of pills for rheumatism and five phials of B12 compound. Again Dr. Poh taught Wang how to use the medicine and again no bill was given. Early this year, Wang again went to the Rakyat Clinic and this time she got from Dr. Poh a bottle of vitamin pills and a bottle of pills for gastric pain. When she asked Dr. Poh how much all the medicine that she had so far obtained cost, Dr. Poh replied that payment did not matter and that he did not want her to pay. Wang said she insisted and finally, Dr. Poh accepted $150 from her. Apart from seeking Dr. Poh's help to buy medcine, her husband and she had also been to the Medical Hall and the Ping Min Medical Hall to buy medicine on three occasions. All the labels on the packages were removed and the medicine was packed in a travelling bag before being despatched to Siong Pek. Out of the $300 given to her by Siong Pek, $150 was paid to Dr. Poh. The remaining $150 was used by her husband and her to buy Chinese medicine. "We had actually spent more than that on the Chinese medicine." Wang's husband, Pang confirmed in his statement what his wife said. He said: "Some time in late 1974, Wang Kui Inn told me she had in the company of her friends in the Malayan New Democratic Youth League (MNDYL), visited the leader of the Assault Unit in the jungles of Pahang. "It was in December 1974 that Wang Kui Inn related to me that she had obtained the medicine from Dr. Poh at Rakyat Clinic. 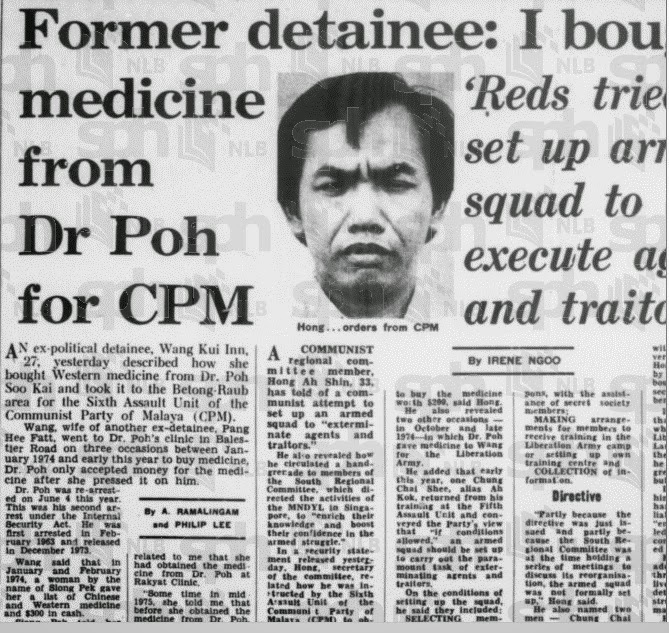 "Some time in mid 1975, she told me that before she obtained the medicine from Dr. Poh, she had told him that the CPM liberation army needed medicine and had asked him if he could help in the purchase and that Dr. Poh had promised to help. "This medicine was sent to the Liberation Army through her friends in the MNDYL." 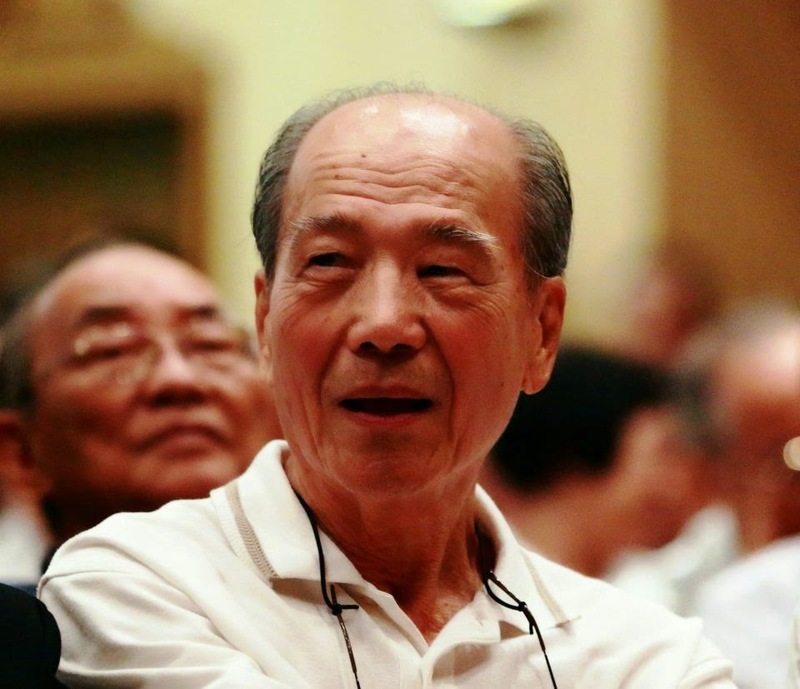 Pang also said that in early 1975, his wife told about her visit to Dr. Poh's home near the Chinese Swimming Club in Amber Road to obtain medicine, which again was later sent to the Liberation Army through friends in the MNDYL. In May or June last year and again early this year, she again visited Dr Poh's home. He said when he was sent by Wang to buy some medicine he was given $60.